Meet our 3 Run/Walk Ambassadors for 2018! Eight years ago Abigail set a goal that she wanted to ACHIEVE and what a goal it was! While watching the Beijing 2008 Para Olympics games at the age of only seven, Abi knew that swimming at the Paralympics is what she wanted to do. Here we are now, at one of Abi’s School Age Clinics at KidsInclusive, just weeks away from her embarking on an adventure of a lifetime and she has done it – she will be competing for Canada at the Rio 2016 Paralympics games! Abi’s mom waits until her daughter leaves the room with the doctor (as she doesn’t want to embarrass her) before she breaks into tears over how proud she is of her daughter. She recalls Abi spending 5 ½ weeks in NICU and how she came out fighting as a baby and has never stopped. Mom can’t believe what a calm, confident and driven young woman sits before us. She truly believes it takes a village to raise a Para Olympian and she credits Abi’s coach Vicki Keith and her YMCA Penguins Swim Club teammates, as well as the therapists at KidsInclusive for contributing to her success. Abi believes that everyone needs to have goals in life and recognizes that some may be harder to achieve than others. She likes to remind the young athletes she helps coach at the pool, that even though you may have a physical or intellectual difference, do not be afraid to try new things just because you may not move the same way as someone else. Do what you love, be yourself and have fun. Achieving is about pushing beyond your limits. Abi states that she is going to take each and every moment as it is. She is not going just to win or for the medals, but to have fun, enjoy the experience and ACHIEVE her goal! Update: In her first Paralympics Abi competed in five events and swam in three finals. In her opening race, the 400-metre individual medley she placed sixth (6th in the World! ), establishing a personal-best time and a Canadian record in the process. 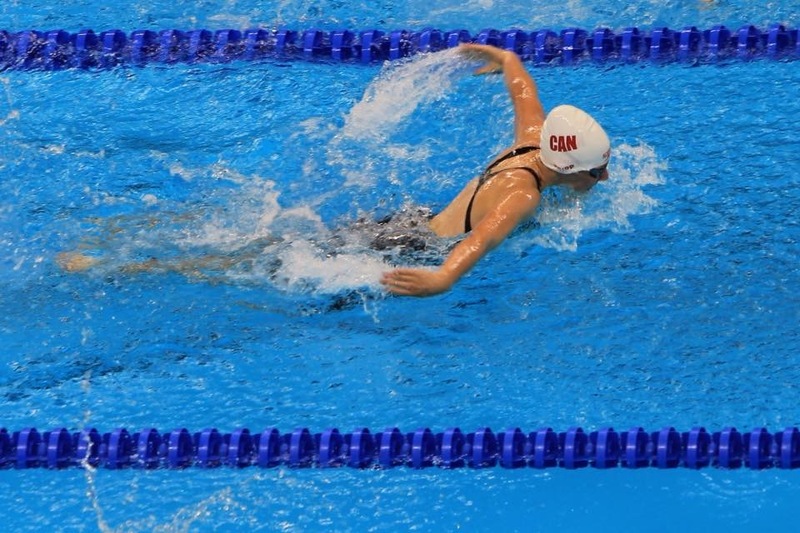 She placed seventh in the 100-metre freestyle and eighth in the 200-metre individual medley. Congratulations Abi – all of us at KidsInclusive are so proud of you! The fear for any parent of a child with a developmental delay is that their child will not be able to play or participate with their peers, that their child will feel that they do not belong. Wondering if Kate would ever be able to keep up with her older brothers caused her parents to lose sleep in those early days after diagnosis. And for a while, she was a polite spectator to her brother’s antics. A tiny red Mini Cooper changed all of that! The 6-volt battery powered sports car is adapted with extra supports and a large red button on the steering wheel to allow Kate to self-propel with a simple push of her hand. After a first tentative attempt at a physiotherapy and occupational therapy appointment at KidsInclusive, Kate was able to bring the adapted car home and try it out on the road. It took moments for Kate to realize that, for the first time, she could finally chase down her brothers. Each aboard their own rides; they took off at 2 km/h like a suburban youth ride-on gang. She laughed as her brothers’ dove out of her way and screamed in delight when she overtook them. Gone were the tentative taps on the button. The pushes became longer and more deliberate until she began to resemble a seasoned Formula 1 driver. Now with a few more rides under her belt, Kate’s brothers often have to remind her to wait for them. 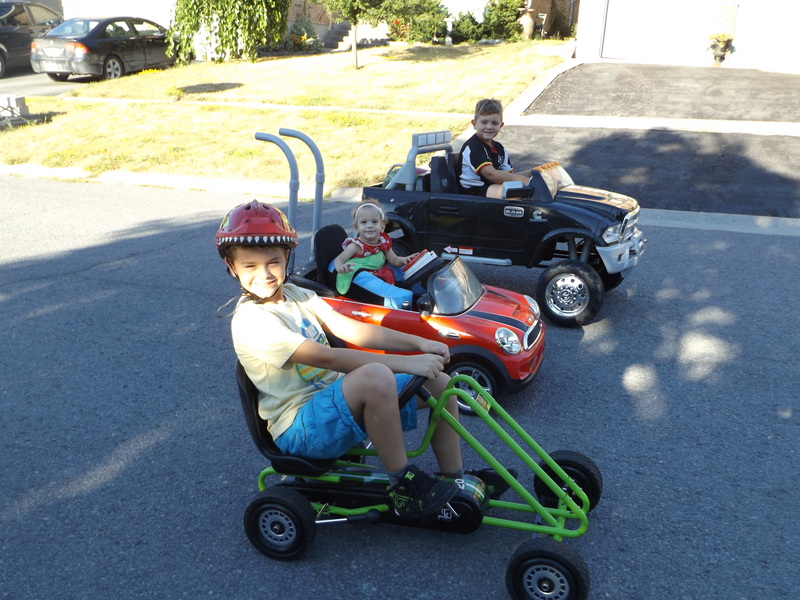 Instead of being the one observing the play, she is now the one attracting spectators as she motors around her neighbourhood, collecting other motorized friends along the way. No longer a bystander, Kate is a full and equal participant in outdoor play. It is clear that here, in her car, with her family, in her neighbourhood, she can play, she can participate, and she does belong. Imagine going to your 20 week ultrasound excited to catch a glimpse of that beautiful baby growing inside you and the technician all of sudden gets quite quiet. Something is clearly wrong and the fear starts to set in. The genetic appointments that followed confirmed for Laura (Mom) and Brendan (Dad) that they were at a significant risk of having a child with Osteogenesis Imperfecta (OI). OI is a very rare genetic condition that causes bones to be very fragile and easily broken as well as other possible features/conditions. Already in utero their tiny baby was already having broken and healing bones. The fact that this was already happening in utero caused many, including the family, to assume she would be severely disabled and maybe not even survive at birth. After early ‘Googling’, Laura learned some kids can have up to 200 breaks per year. But Laura and Brendan did not give up hope. At birth, Keira arrived with a full head of beautiful black hair and gorgeous blue eyes and Laura remembers just feeling so excited with their beautiful new baby girl. Quickly it was confirmed that she did have OI and again the fear of the unknown was present. Laura was told that Keira would not walk and likely be in a wheelchair. Again…Laura did not give up hope or let fear stand in their way. At six weeks old Keira had her first break post birth…her femur… two days before Easter Sunday and her baptism. With family from Ireland and lots of celebration activities to plan and unfold, there was no time to worry or let fear stand in the way. In full cast, Keira was at the front of that church on Sunday beaming her most beautiful smile with her family so proudly standing by her side. While most people would look at this with worry and fear, Laura spun it to be “a good thing” as it allowed them to start infusion treatments which a child with OI is only able to receive after a first long bone break. Laura feels starting this so young has given her an advantage. 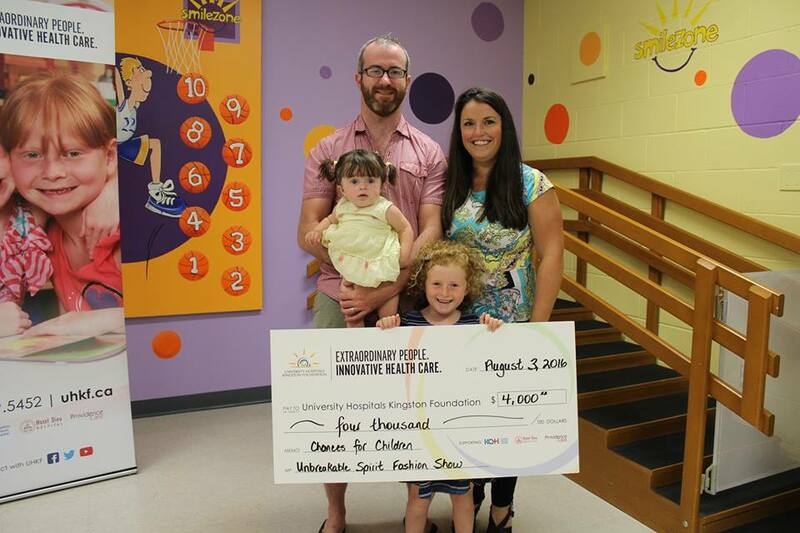 Laura started travelling to CHEO to begin infusion treatments every three months. These treatments work to strengthen the bones to make them stronger and more resistant to breaks. Laura attributes infusion treatment, regular physiotherapy at KidsInclusive, big sister Molly’s cheering and coaching, and Keira’s fierce determination to the fact that she is now not only walking but manipulating her environment with some speed! Keira is a tiny but mighty 19 month old little girl with loads of determination and a happiness that just exudes out of her. She walks and participates fully with her family and in her daycare, which Laura never thought she would be able to let Keira do, for fear of her breaking further bones. OI does not define her, it’s only a part of her and in fact only makes her more determined! Keira is without a doubt inspirational, and it’s not hard to see where she gets her determined spirit from. At the KidsInclusive annual Walk/Run fundraising event, we all watched as Laura ran our 5k route pushing Keira in a running stroller, shouting to those on the sidelines cheering “I’m doing it for her” and pointing with a big smile at Keira. What they didn’t know was that Laura didn’t train for the race; she just picked up and said I’m doing it for Keira and ran the whole darn thing. She shared that when she got tired she just looked at Keira’s smiling face and it kept her going! Laura didn’t stop there either. 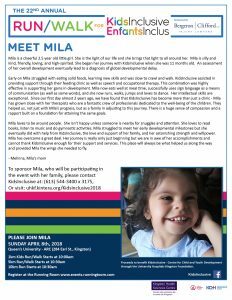 She went on to coordinate and facilitate a very successful fashion show/silent auction event – “Keira’s Unbreakable Spirit” to raise awareness for OI in our community. 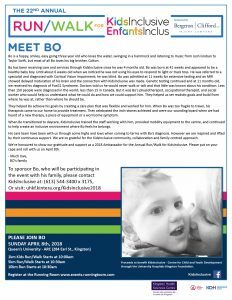 She never expected it to become the event and success that it did and the exciting end result was that she raised awareness and over $9000, of which she graciously donated $5000 to the international OI society and $4000 to KidsInclusive. Both Keira and her whole family have been truly inspirational to our Centre and our whole community! We don’t know what the future holds for Keira but we do know that regardless of her physical needs she will continue to be inspirational to her family, community and those of us lucky enough to know her truly unbreakable spirit. 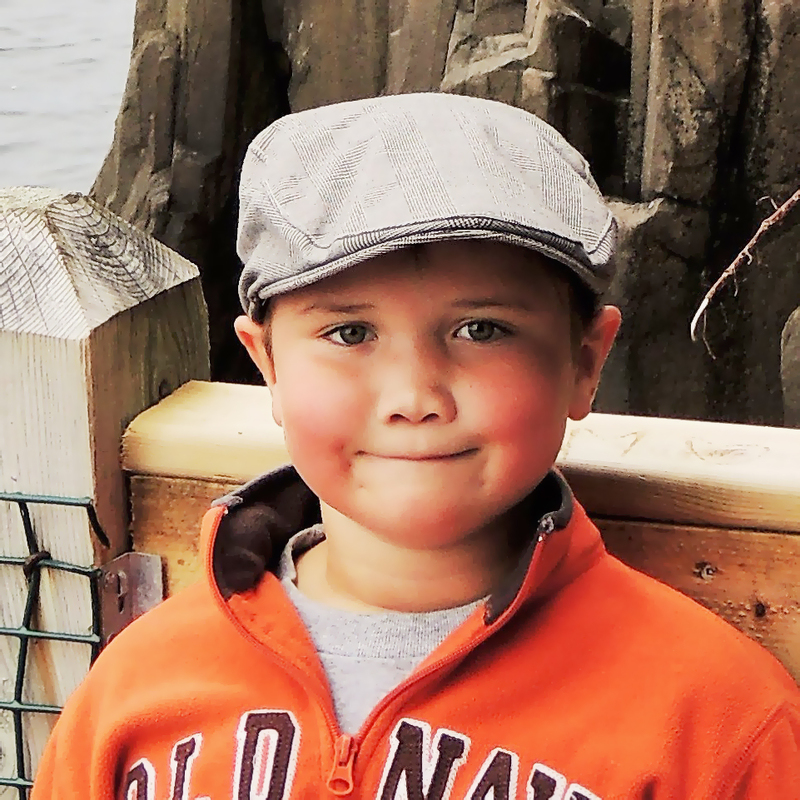 Braden is a determined and active 10 year old boy with Larsen’s Syndrome. While his condition affects his mobility, it does not stop him from trying to keep up with his peers or enjoying ball hockey at school. KidsInclusive has been there for Braden since he was released from hospital as a baby. All of Braden’s therapists have become almost like family with our weekly visits for physiotherapy, occupational therapy, speech and feeding. We cannot say enough about the care Braden has received over the years. Adaptive tricycles were available to use during physiotherapy sessions which made rehab exercises after surgeries more fun. OT has been involved to help him succeed at school with ideas and tools for aiding his fine motor skills. With the help of KidsInclusive Braden has become a confident individual who does not let his physical limitations stop him from being the best he can be. We were very excited when Braden was asked in 2016 to be one of the Ambassadors for the KidsInclusive annual Run/Walk event. Hello, my name is Janessa. I am 16 years old and I have cerebral palsy. 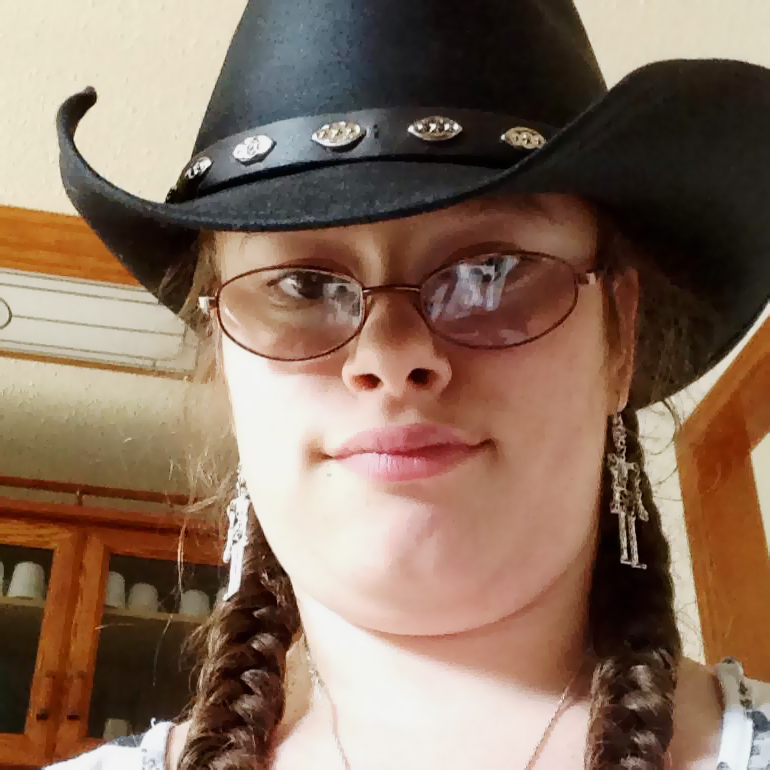 I have been going to KidsInclusive since I was about 4 years old. When I go to KidsInclusive it feels like I’m part of their family. The therapists are encouraging and fun. So I thought I’d share a couple of my favourite memories. During therapy my physiotherapist, Karen, was encouraging me to throw bean bags in to a basket. If I was successful she motivated me by agreeing to jump on one foot in a circle and balance the bean bag on her head while singing the ABC’s. I think she lost a little weight that summer! Another fond memory at KidsInclusive is when my therapists, Karen and Sara, were preparing me for my first surgery. They dressed me up like a doctor and I got to put an IV in a doll. Thank you for always making me feel welcome and care for! 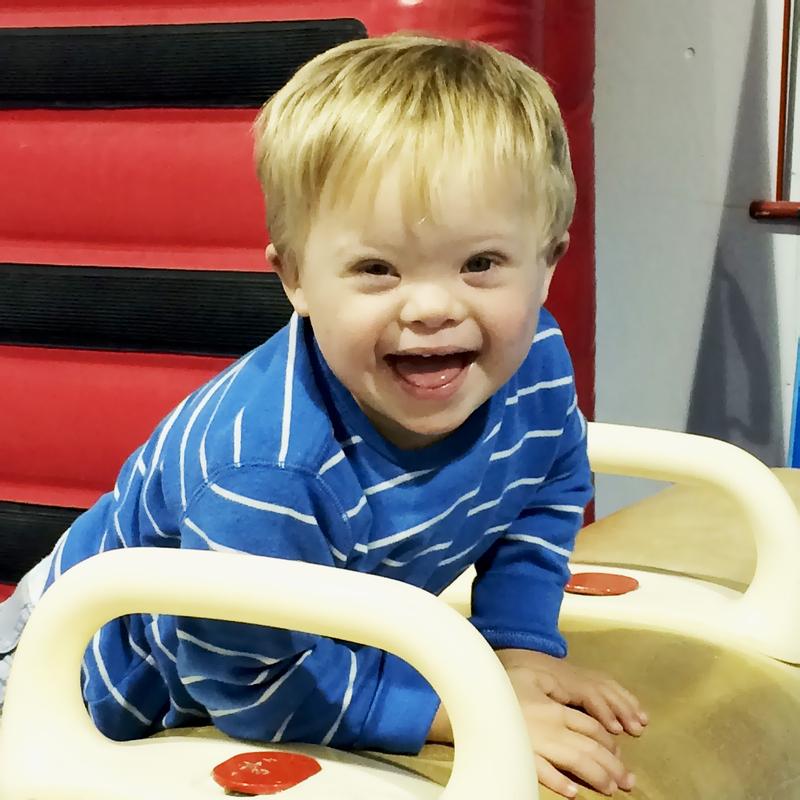 Lochlan is a very happy three year old boy with Down Syndrome. Always quick to smile, he has a very gentle and resilient nature. He loves to swim, loves his baby sister, Gwen, read his books, and plays at the park with his friends. Since he was two months old, the team at KidsInclusive has been helping Lochlan achieve many of his developmental milestones. Programming from a group of incredibly talented and encouraging individuals has been so successful. Under their guidance, he has made such great progress in his gross and fine motor skills and his communication skills. Now, three years later, this team providing physiotherapy, occupational therapy and speech therapy continues to follow him to ensure he is learning, thriving, and growing. The team even visits him at his daycare! KidsInclusive has provided many adaptive aids, such as a walker to help him build strength and confidence. All this hard work is paying off – Loch took his first steps on New Year’s Eve! Seeing the progression in Loch’s abilities through the help and effort of everyone at KidsInclusive is very rewarding. We are so grateful to have such an important resource here in our community and are so proud of Loch and everything that he has accomplished so far.